Use these links to navigate through this section. 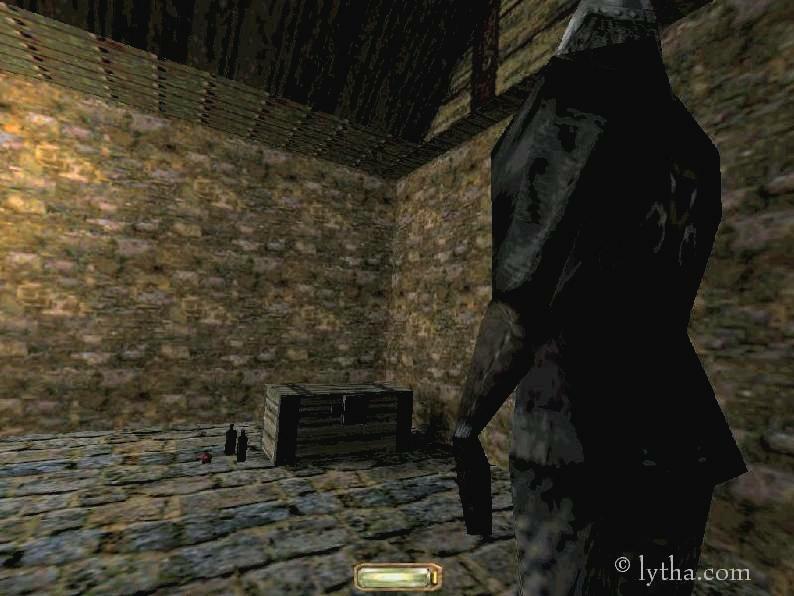 Hints for "Lord Bafford's Manor"
General Remarks about "Lord Bafford's Manor" in the "Lytha Way"
You want to steal the 2 flashbombs from the chest that this Guard is facing. Instead of waiting that he reaches his guarding position, you can run past him, and hide under the stairs until he quieted down again. 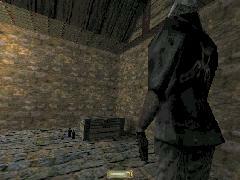 Or you thrown items on the metal floor behind this Guard, until he starts searching. Use the time when he has his back turned, to run to this chest, and to the stairs. 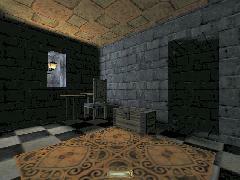 The 'secret' room of Lord Bafford. Besides the interesting book of where his money is going to, it contains also a key and a bottle of FineWine. The way into this room should be known by a player who is mad enough to try to play in the "Lytha way". The easiest possibility to reach it, though, without being seen or heard by the two Guards on patrol, is the small bathroom opposite of the Throne-Room. Moving slowly on the noisy floor tiles, helps also. I am also sure that it is possible just to run into this room. 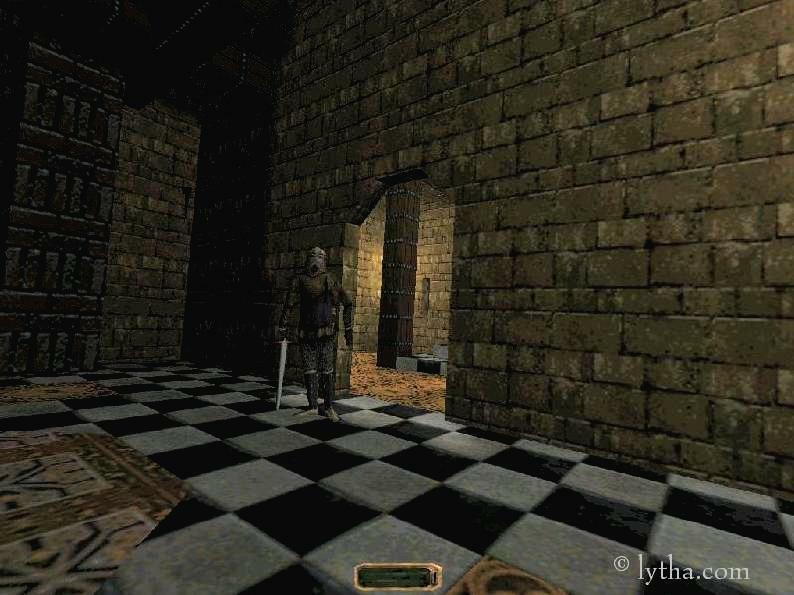 The Guards will follow the player, of course - but it is an easy thing to wait that they calm down again, while one is just sitting under the stairs. 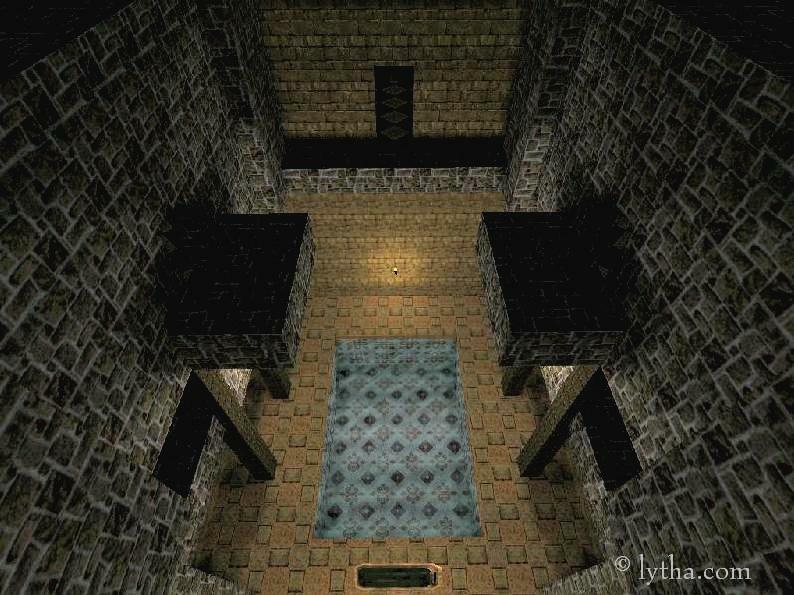 The final frontier for the beginner in the "0 damage way" (AKA "Lytha way"): The Throne-Room of Lord Bafford's Manor. 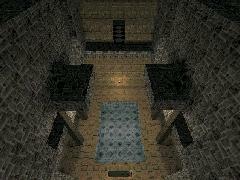 Clickety clackety floor tiles, a strong guard, and lots of torches. 7 torches, to be more exactly. Well, the general way through this room is: Douze the torches as soon as you can see them. For the 3 torches in the Throne-Room itself: You can also douze a torch that you can't see directly, as long as the water arrow hits a wall close to that torch. Time for some experiments. Another, very unstylish but useful, solution is to run into the Throne-Room (make sure that one of the doors is unlocked and open! 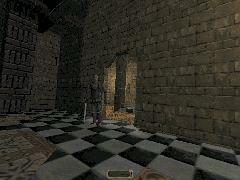 ), to ignore the Guard, grab the sceptre, and run out of the Throne-Room. Avoiding to be killed by the 3 angry Guards needs a little bit of practice - a perfect area to flee to is of course the pool. Jump from the balcony in the E, so that it is less likely that you kill yourself with that jump. Fun is a very subjective thing. I, as an example, enjoyed one evening (it's a while ago now) to knock out exactly one person (in this case, it was the Guard in the Throne-Room), and to carry him to the starting position. The clue was that I never even touched the other people in this mission, so that it was a very extreme practice of the sneaking abilities. Well, fun is a very subjective thing. I am sure that it is not very funny for everyone to sit on a ladder of the sewers, waiting that the Guard falls into the open entrance to the sewers - because this takes several hours. The Pool of Lord Bafford. I am sure, though, that this example here is fun for everyone. It is easily done: Reach the roof of Lord Bafford's Manor (these small railings at the 2nd floor of the garden are perfect: run+jump at the outer walls). Find your way to the E of the roof. Turn your Gamma to the maximum, and the brightness of your monitor higher. Now you can see a grey wall in the darkness. (W of the eastern roof). Approach it, and hop onto it. Be careful, because the wall is not very thick... what you want to do now, is to approach the center of the wall, and to jump into the pool.